Koh Samui is well know for its beautiful beaches and incredible turquoise water. There are many beaches on the island to choose from. However, only a few are great for swimming. I’ve been to most of the beaches. While some of them are rocky and not suited for swimming, others are perfect for a little exercise. Read below to find out which are the best beaches for swimming in Koh Samui. I’ll start with my favorite. This small beach situated on the eastern side of the island is a hidden gem. With white sand and clean water, Silver Beach is a paradise for swimmers. There are almost no waves and, if you go towards the big rocks you can even swim with hundreds of colorful fish. In my opinion, Silver Beach is the best beach for swimming in Koh Samui but there are other amazing places too. Read more about the Silver Beach here, in my complete guide. Probably the most popular beach on the island, Chaweng Beach is great if you are looking for a place to swim. Unlike Silver Beach, at Chaweng Beach you’ll find that there are more waves but don’t worry, you can still swim in peace. The only downside is that here you won’t find such a thriving marine life. Also, being very popular among tourists, sometimes Chaweng Beach can get pretty busy. 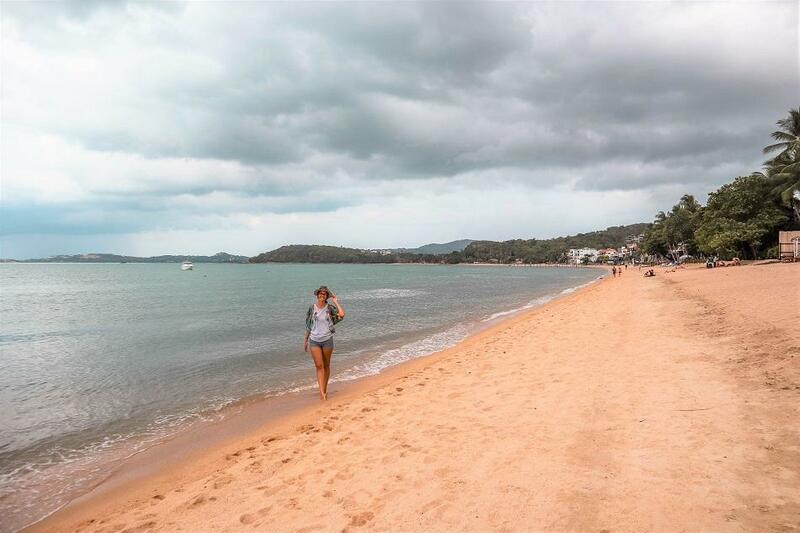 If you want to find some hidden beaches in Koh Samui, click here. Situated in the north, Maenam Beach is one of the biggest beaches on Koh Samui. The water is pretty calm and perfect for swiming. Maenam Beach is a good choice especially if you are looking for a place where you can swim long distances. Unlike its bigger sister (Maenam Beach), Bophut Beach is a bit more crowded since it’s located near one of the most important tourists attractions on the island – Bophut Fisherman’s Village. The water here is great for swimming and you’ll find a plethora of restaurants right on the beach to settle your hunger after working out. Situated right near the famous Hin Ta and Hin Yai stones, Lamai Beach is a bit more challenging for swimming. The waves are a bit bigger but nothing to worry about. Lamai Beach is popular among tourists. Therefore, don’t expect to be the only one here. While you’re still in the area, I would definitely recommend visiting the amazing Overlap Stone or the Na Muang Waterall 2. These are the best beaches for swimming in Koh Samui. If you would like to suggest other beaches, let me know in the comments section below.